Over the weekend, Bunt released five 1/1 base cards in special packs. If you are curious as to what I am talking about – these cards only have 1 copy. Although 1/1s have been given out for contests and tournaments, or pulled in packs for some insert sets, there has never been base cards with that designation in the game. Coming on the heels of big announcements from the release of Topps Series 2 with a Bunt inclusion, this is some pretty big news. For good reason, 1/1s of this nature are relatively controversial. They highlight the ultimate type of chase for users with deep pockets, and this is further exacerbated by the 50k pack price that was installed along side it. Each pack offers 3 cards, blue and gold, with a 1:4000 shot at one of the five 1/1s. In the digital side of things, these type of cards are still very rare and very difficult to obtain. On the physical side, its much less so, with 1/1s driving the high end secondary market more than any other type of card. I own a number of the cards in physical, which usually signify a special type of content included. We saw a glimpse of that with the Andrew McCutchen 1/1 MLB Logo relic, which is a common usage of the designation on the physical side as well. This isnt the first time 1/1 parallels of the base cards have been offered in the Topps apps, as last year, Huddle went nuts when each team got one player in a special Gold Helmet parallel 1/1 during the last weeks of the 2014 season. The packs were much cheaper, and being that they were so cheap, the cards sold out in less than 5 minutes. The velvet rope price point on the bunt side will stretch it out a bit longer. 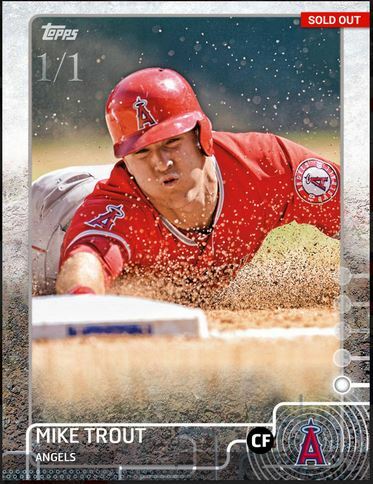 I understand that some users are upset that Topps is releasing cards that they have a very small shot at, but I think this is a direction that isnt meant for everyone to be on board with. Whereas we got Bazooka cards at a very accessible rate for some users, the one of ones will be aimed at the complete other side of the spectrum. These are MEANT to be difficult, and that means only a few people will get the joy of having them in their collection. My only complaint is that the border isnt a different color or something like that, to showcase just how special these cards really are, but I guess that is something that wasnt available. I have asked the team for “Superfractor” parallels of the base cards for a long time, which have a distinctive pattern to highlight the designation of the card. These Superfractors are some of the most expensive cards in existence, and it would be very nice to see them come to Bunt. For reference of how special they are – the 2009 Bowman Chrome Mike Trout rookie superfractor autograph is valued at over $50,000, though its unlikely it will ever be for sale again. I dont know about you, but I am very interested to see how far the 1/1 can go over the remaining weeks of the season, as its clear to me that there is a high demand for the cards. This entry was posted in Reviews and Commentary and tagged Baseball Cards, Bunt, Football Cards, Huddle, Sports Cards, Star Wars, Star Wars Card Trader, topps, Topps Bunt, Topps Huddle. Bookmark the permalink.